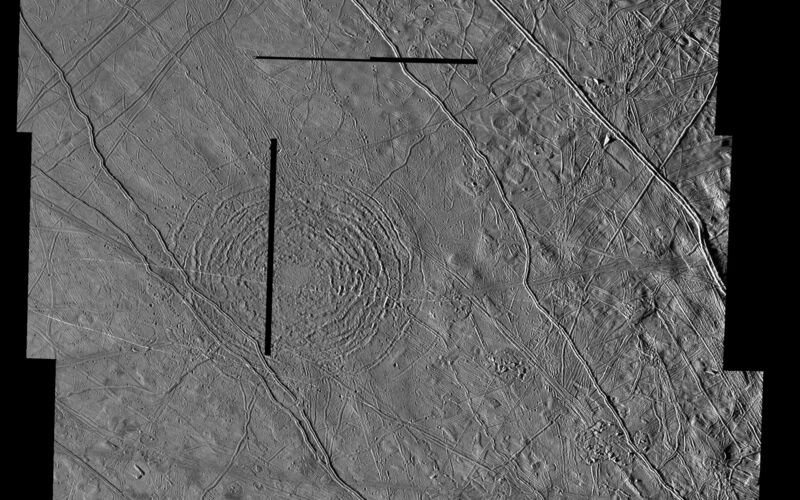 This mosaic shows the Tyre multi-ring structure which is thought to have been formed by a large impact onto Jupiter's moon Europa. The effective crater (large bull's-eye feature) is about 40 kilometers (25 miles) across while the entire structure is much larger. The feature was formerly known as Tyre Macula. 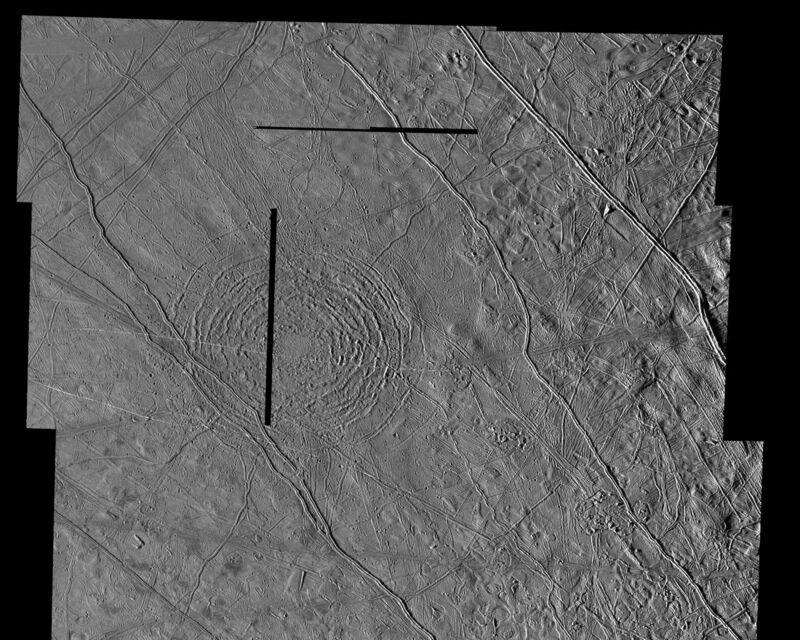 The concentric rings, of which five to seven can be discerned easily, consist of troughs and ridges. Tyre is one of the few impact structures on Europa that has concentric rings and may indicate an area where fluid material, perhaps liquid water, lay below the surface at the time of impact. A few ridges within Tyre appear to have been partly destroyed at the time of impact. North is to the top of the picture and the sun illuminates the surface from the left. The mosaic is centered at 34 degrees north latitude and 144 degrees west longitude and covers an area approximately 424 by 456 kilometers (265 by 285 miles). 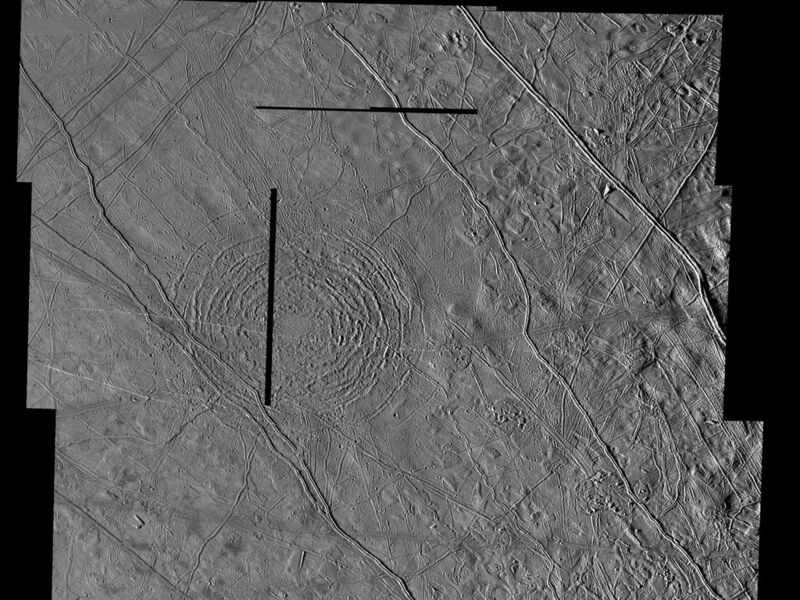 The resolution is 170 meters (185 feet) across. 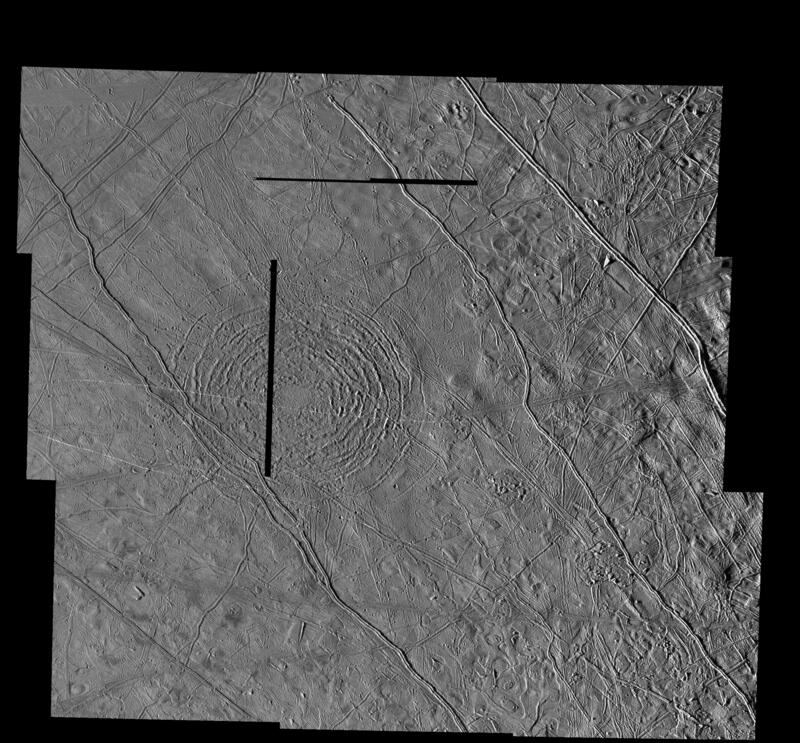 The horizontal and vertical black lines in the mosaic indicate gaps in the data received for this image. The images were taken on March 29, 1998 at a range of approximately 18,000 kilometers (11,250 miles) by the Solid State Imaging (SSI) system on NASA's Galileo spacecraft. The Jet Propulsion Laboratory, Pasadena, CA manages the Galileo mission or NASA's Office of Space Science, Washington, DC.